Remember when you were a kid and your dad came home from a weekend up north without the mustache he’s had your entire life because his friends shaved it off when he passed out? No? Just us? Okay, well, remember when Doug Melvin shaved his mustache a few years back and he looked naked and utterly unfamiliar? It was weird! If you thought witnessing your loved one and/or Milwaukee’s former General Manager without his patented ‘stache was strange, seeing a famously mustachioed mascot without his cookie duster will mess you up. How do we know? 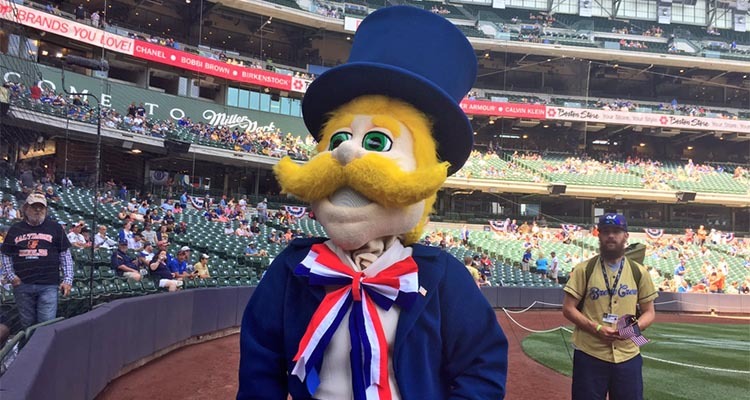 Well, late last week, Milwaukee Brewers mascot Bernie Brewer pledged his support for The Movember Foundation by “shaving” his mustache to help raise money for men’s health. A few days after first seeing his follicle-free felt face, we’re still thinking about it. Bare-faced Bernie Brewer is equal parts terrifying and wonderful. All things considered, it’s cool to see the Milwaukee Brewers organization and their mascot doing their part to help others…even if the image has been scorched into our subconscious beside Gritty (the Flyers’ new mascot) and the yolked-up Fort Wayne Mad Ant.